Politicians utilize many tricks to push forward their agendas. One such trick is the use of emotional language. It’s a propaganda technique long-implemented, and it has proven successful time and time again. It works by appealing to the feelings of women and feminized men in society. Malicious anti-white policies are given titles that sound as if one is reading the cover of a children’s book. Though the actual content of those policies and bills may explicitly discriminate against whites, result in the opposite of the supposedly intended results, and/or violate the constitution, dumb people do not challenge it because it’s coded in emotional language. It fabricates a feeling of contentment towards the state because it sounds like the government is doing a good thing. The most recent example of this dangerous manipulation comes from the DREAM Act, which has two versions currently active in both the Senate and House. It is designed to grant nearly full amnesty to (mostly Mexican) illegal immigrants in the U.S. The title, “DREAM,” is an acronym for Development, Relief, and Education for Alien Minors and is obviously designed to disarm the fight-or-flight response of people via emotional language. The illegal aliens it pertains to are even called “Dreamers.” So now, if one is to criticize the bills, they must bear the accusation that they are fighting against Dreamers, which invokes knee-jerk, hysterical reactions from hyper-emotional plebs. 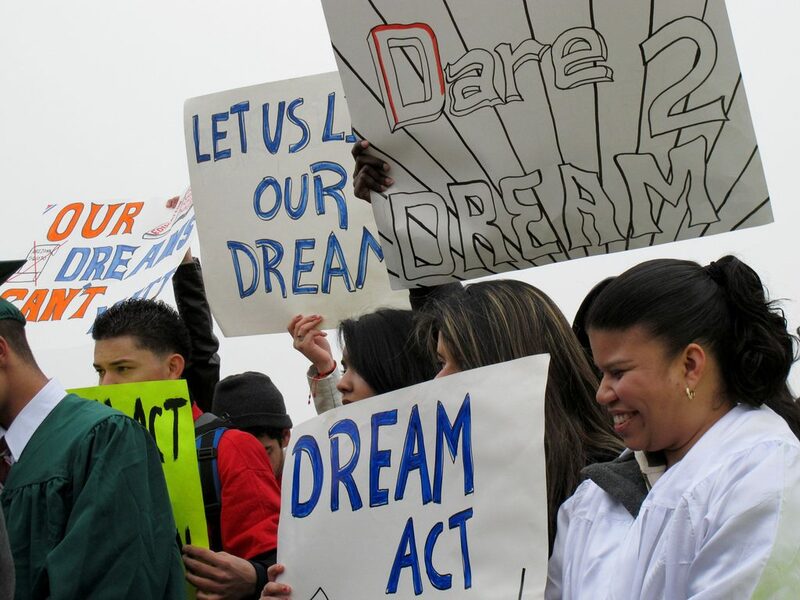 The results of the DREAM act, however, are far more consequential than the efforts of leftist propaganda. If passed, it will change the course of history. With the current incentives that draw people to illegally migrate into the U.S., it will result in tens of millions of third-worlders flocking to America and permanently changing the demographics of this nation forever. Hispanic immigrants overwhelmingly vote for more government, which is what the left wants in order to instill their socialist nightmare. So, Democrats fight tooth and nail to pack the voting booths with low-IQ, low-information Hispanic voters in an effort to attain and keep as much power as possible. It is a systematic agenda to obtain full control of the U.S.
An invasion of this magnitude will also expedite the global effort of white genocide. America is one of the few remaining western countries with a population of majority native whites, though that is changing rapidly. The DREAM Act will inevitably be the final nail in the coffin that pushes whites into becoming minorities in their own nation. It will truly be the death of the West, as the immigrants who come for the treasures of western civilization do not share our values and will merely change America into Mexico 2.0. The invaders will be pandered to by politicians and white interests will forever be squelched in the name of multiculturalism. We are on the cusp of radical change. One way or another, the United States and the West as a whole will be forever altered. The madness increases exponentially every day. This Weimar-style republic will come crumbling down like the Roman empire, probably sooner than later. If the DREAM Act goes through, though, we will be experiencing those changes very rapidly and very harshly. The possibility of a softer, more delicate transformation of society will be gone, and the radicals will do what they feel must be done.